Study participants' physiological reactions to stress were measured to see how those reactions relate to political decisions. If you’ve ever wondered why people stand where they do on the political spectrum, science might have at least part of the answer: People can be biologically predisposed to certain feelings toward politics and society. A new paper lead-authored by UC Merced graduate student Chelsea Coe indicates that physiological factors can predict how someone will react when presented with political scenarios — an idea that demonstrates an emerging area of study, the intersection of biology and politics. 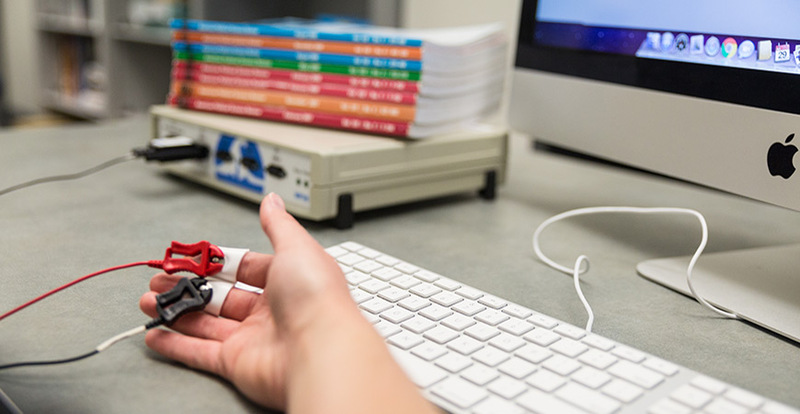 In a series of experiments with more than 200 fellow students, Coe and her colleagues used a machine to measure people’s baseline physiological reactions to a series of pictures. This baseline is measured through a person’s skin-conductance response, which is taken through the sweat glands in their fingers. Participants were then asked about various topics including gun control, immigration, abortion, gay marriage and the Ebola outbreak, and each topic was framed in different ways. One scenario asked them to consider whether they would allow a KKK rally to come to Merced. Some students saw this presented as a “free speech” event while others saw it presented as a public safety concern. Biology is only part of the puzzle when it comes to long-held beliefs. Understanding a person’s baseline reactions to stresses can help researchers predict who will have which political reactions. But Coe’s study, recently published in the Journal of Politics, finds that those who are physiologically highly sensitive to threat were more likely to be persuaded by the safety concerns raised by the KKK rally than those who are less sensitive to threat. 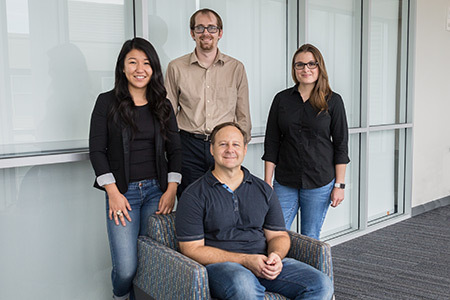 UC Merced is one of a small group of campuses in the United States that has the physiological equipment for these kinds of studies, and Coe said there is a growing group of scientists looking at these questions in a small and close-knit community. She regularly works and connects with other universities such as Vanderbilt and Temple universities, the University of Nebraska, Lincoln, and William and Mary College. Through her avenue of study with her adviser, Professor Stephen Nicholson, and Professor Matthew Hibbing, both in the Political Science group in the School of Social Sciences, Humanities and Arts, Coe has been able to travel to the other universities for conferences and workshops. She goes to talk about her projects and the methodological practices in using biological measures for research, but also to talk about the place biology has in politics. Being published in the Journal of Politics, one of the top three publications in the political science field is important because it reaches a wider audience, she said. She also hopes studies like these can have practical applications for non-scholars, too.